Camps Australia Wide® is now in its twentieth year of operation and are Australia’s most recognised travel guides, through the production of the ever popular Camps series (Camps 10) and Caravan Parks Australia Wide (Parks 5). Whether you are heading away on the “big lap” or just a weekend away, let our Camps App guide you. 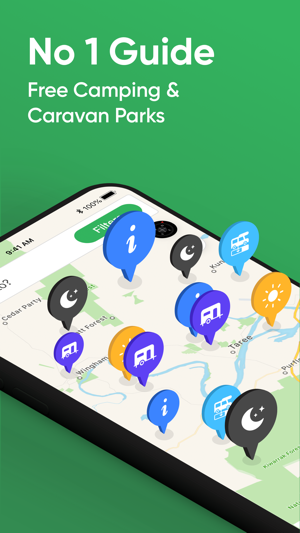 You will save money and travel further with our Camps Australia App, the personally verified camping and caravan park guide. The Camps team travel extensively and our years of experience ensure we deliver the best travel experience for you. 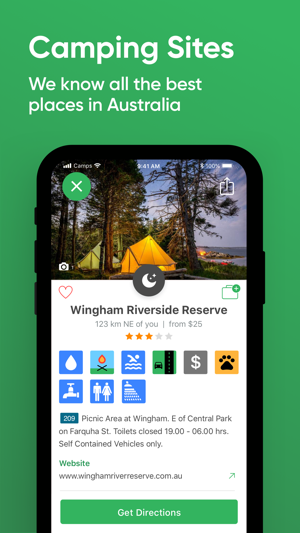 You will love our latest generation Camps App, with more sites and better usability than ever before. 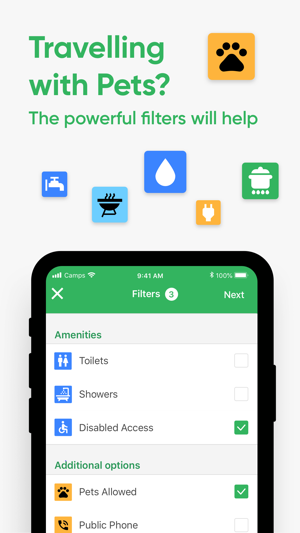 Ensure you visit or stay at the places that are best for you, by using the Camps App filter. 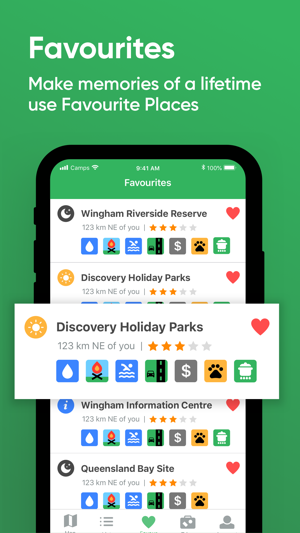 The filter means you see the sites that suit the way you like to travel, and you can even design a travel experience using the favourites and planning function. We now offer more places to pull up than ever before. As we personally verify them before they go live, you can be confident they are approved and active sites not just a gravel pit on the side of the road, or duplicates of the same site. Our listings include free and low cost camping, station stays, national parks, state forest parks and rest areas, showground camping, hotel and pub camping, as well as all the tourist caravan parks throughout Australia. We aim to offer everything an RV traveller needs. Regarded as the ‘Traveller’s Bible’ you can plan trips with stopovers that are free or low cost – we even tell you if the camp spot is close to the road, has a pleasant outlook, mobile phone coverage or dry weather access. You can also add reviews, give a star rating, create favourites and share sites with friends. Works OFFLINE as well. 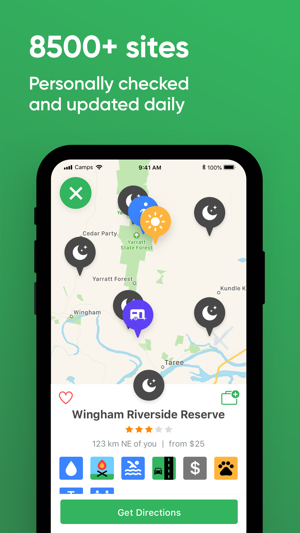 You do not need to worry about WiFi or a phone signal, you can download the maps and sites before you leave and no matter where you are you will have all the vital information at your fingertips. Take your pet on the road - every listing has a symbol that tells you straight away if your pooch or pet will be welcome. We list over 4000 pet friendly sites. A trip planner allows you to create multiple trips in advance, or track the sites you have visited, and add your own comments to the trip diary. co-ordinates, as well as symbols to show suitability for cassettes, holding tanks, water availability (whether a fee is applicable) together with access for big rigs. We offer excellent value for money. 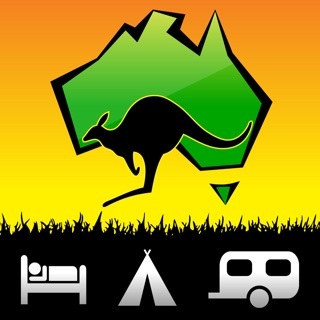 As cheap as chips - it is the only camping guide you will need for the whole of Australia. To stay up to date after your purchase there is an “In App” auto-renewable subscription option to enable you to receive new and updated information. The subscription contains 1 month of free trial and 1 year of full access to app resources and updates. It automatically renews unless auto-renew is turned off at least 24-hours before the end of the current period. The payment for this subscription will be charged to iTunes Account at confirmation of purchase. Your account will be charged for renewal within 24-hours prior to the end of the current period, and identify the cost of the renewal. You can manage your subscription and turn off auto-renewal in your iTunes account settings after purchase. Get away from the hustle and bustle, you’ll make memories of a lifetime, knowing the fun of freedom camping – meeting like-minded travellers, share sites on Facebook or emails with friends and enjoy adventures with your partner or family. CAMPS AUSTRALIA WIDE has proven to be a hit with travellers across Australia. Why not join them?